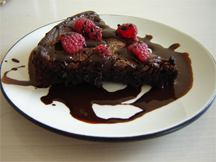 A flourless chocolate cake, with raspberries. It looks delicious, but as convincing as this photograph might be, we don't know for sure what the cake tastes like without actually tasting it. So it is with team composition. When we learn that a team is having interpersonal difficulty, we can't be sure what might be the sources of that difficulty without actually experiencing life on that team. Too often, we assume that making a change of personnel — usually one or two people — will solve the problem. Rarely is this assumption valid. In most cases, the entire team, including the team owner, is involved. Moving people from one team to another can result in just spreading the trouble. Sometimes we get so caught up in the small stuff that we forget about the big stuff. We try to do what nobody can do. We take the hard path because we think it's easier. Or we choose the path we know, even though we know it leads to trouble. Here are twenty-three thoughts to keep in mind when caught up in the small stuff. It's better to cancel a meeting that shouldn't be held than to hold a meeting that shouldn't be held. When a project gets way behind schedule, you have to go faster than "best case" just to catch up. Actually catching up is unlikely. Tarzan's First Rule of Change: After you grab the next vine, you have to let go of the vine you're on. They don't call it the "red-eye" for nothing. If you only call people when you want something, they'll eventually learn how to use Caller ID. Advice for troubled teams: If you're mixing batter for two chocolate cakes in two bowls, and you accidentally drop some asphalt into one bowl, moving some of the asphalt to the other bowl doesn't help. Multitasking is often just a way of convincing yourself that you're getting more done than you really are. The need for continuous communication with coworkers might really be a need to feel needed. Troubles at home eventually find their way to work. Troubles at work eventually find their way home. find their way to work. find their way home.more stuff you pack for the trip, the more stuff you'll be lugging around. The more stuff you pack for the trip, the more stuff you can lose someplace. Most people have little tolerance for ambiguity. What they don't know, they make up. To reach unexplored territory, you have to step off the well-trodden path. Number One way to halt forward progress: start squabbling about who gets credit for progress already made. When things are going well, getting the small things right can make outcomes even better. When things are going badly, getting the small things right might be just an irrelevant distraction. If someone is constantly trying to do part of your job, have a chat. If that fails, or if you can't chat, do your job before they do it. Number One sign of disorganization: "Where did I put that?" Number One sign of overload: "Did I or didn't I already do that?" Advice given but unsought soon becomes advice heard but unheeded. Working smarter is harder. That's why so few do it. Would you like to see your comments posted here? rbrenDhItBRIRBIfBxWVkner@ChacZbKmtlaNUNbYttPPoCanyon.comSend me your comments by email, or by Web form. When we seek volunteers for specific, time-limited tasks, a common approach is just to ask the entire team at a meeting or teleconference. It's simple, but it carries risks. There are alternatives. Just as real concrete objects have attributes, so do abstract concepts, or constructs. But attempting to measure the attributes of constructs as if they were the attributes of real objects is an example of the reification error. In performance management, committing this error leads to unexpected and unwanted results. I offer email and telephone coaching at both corporate and individual rates. Contact Rick for details at rbrenZkwaeHwZoyfusLDwner@ChacAHtWJWGYUWndqrcpoCanyon.com or (650) 787-6475, or toll-free in the continental US at (866) 378-5470.